Dehydrons are structural defects in proteins. Recent studies at Ariel Fernandez Consultancy reveal that dehydrons are also players in enzyme catalysis, a finding that heralds a new era in Biotechnology. 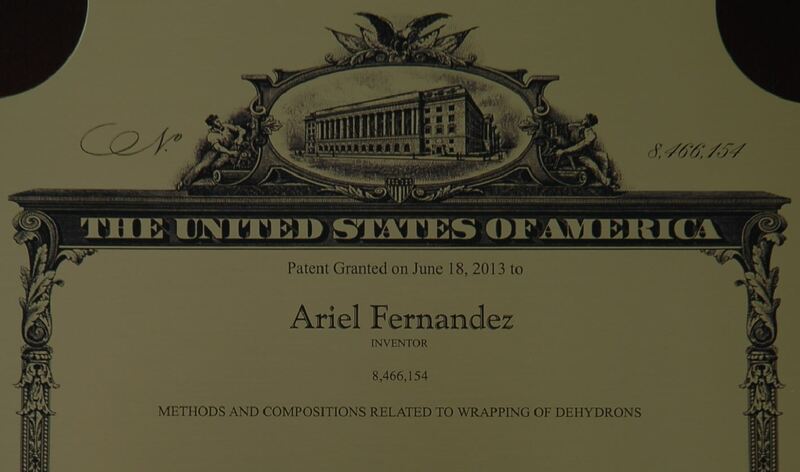 US patent 8,466,154: "Methods and Compositions Related to Wrapping of Dehydrons". Inventors: Ariel Fernandez et al. Enzyme catalysis has been often regarded as a closed chapter. The newly discovered catalytic role of structural defects in proteins - the so-called dehydrons - invites a serious revision of this opinion. Many elementary steps in biological chemistry will need to be re-written, while novel designs for enzymes and inhibitors emerge. Ariel Fernandez Consultancy serves the Pharmaceutical and Biotechnology industries by harnessing fundamental discoveries that broaden their technological base. In line with this goal, recent research at Ariel Fernandez Consultancy revealed that a structural defect in natural proteins known as dehydron plays an important role in enzyme catalysis. The newly discovered structure-based effector of protein function has broad implications for biomedical engineering. Dehydrons are structural defects in proteins discovered a decade ago by Ariel Fernandez Stigliano and coworkers (Ariel Fernandez (2010) Transformative Concepts for Drug Design: Target Wrapping, ISBN 978-3642117916, Springer, Berlin). Strikingly, it has been recently shown that dehydrons are also important components of the protein enzymatic apparatus (Ariel Fernandez (2014) Communication, Journal of Chemical Physics 140, 221102). The newly discovered catalytic role of dehydrons is enabled by their known physical attributes but hinges on their recently established chemical function: a dehydron may act as a powerful chemical base. As recently shown at Ariel Fernandez Consultancy (“Dehydronic Enzyme”), when this chemical function is coupled with the observation that dehydrons are ubiquitous at the catalytic sites, a striking picture with biotechnological implications emerges: dehydrons behave as structural activators of enzyme catalysis and hence become target features guiding enzyme and drug (enzyme inhibitor) design. Since dehydrons are now being shown to participate in catalytic chemical steps, much of the mechanism in biological chemistry will have to be revised, while a paradigmatic concept for biomedical design emerges. Thus, novel bio-engineering tools for molecular optimization will be implemented at Ariel Fernandez Consultancy as dehydron-based enzymatic effectors are created or removed though site-directed mutation, fine-tuning the local integrity of the protein structure. The finding makes it possible to activate or silence a catalytic site in an enzyme by altering the protein composition to create or annihilate a nearby dehydron. Meanwhile, novel drug-based inhibitors of enzymatic activity will emerge as dehydrons are targeted through engineered protein-drug associations. The discovery has broad implications for biomedical engineering. The advent of the “catalytic dehydron” is likely to herald a new era for the design of enzyme catalysts and pharmaceuticals. Ariel Fernandez Consultancy addresses scientific needs of the pharmaceutical industry, providing insights into drug design that hold potential to broaden its technological base. The consultancy seeks to provide the kind of thought leadership that translates into a competitive advantage. The consultancy harnesses scientific knowledge to design prototypes with optimized safety and therapeutic potency. Chemical space is parsed to meet specificity requirements, adding therapeutic value to the optimized leads.